Escondido agents of Real Living Lifestyles gives back to their local families in need. We appreciated all the contributions that were collected and our great office spirit to help less fortunate at this time of the year! Real Living Lifestyles has a very special group of agents and staff in their Escondido office. The office held their annual White Elephant Auction/Holiday Party last week for the third year in a row. All week agents bring in items to put on display, and at the party they auction them off and donate the proceeds to Interfaith Community Service. Interfaith implements comprehensive programs to provide basic needs, social services, counseling, and economic development to empower the disadvantaged in our community. This year they raised $2300 for the Interfaith Community Service. The agents this year were so proud of what a great success the auction was. 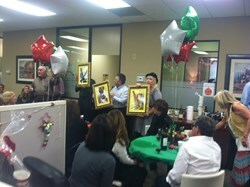 "Wow, what a group of fun loving, from the heart, real estate professionals we have in our Escondido office. The festive celebration of the holiday season, was only overshadowed by the Real Living Lifestyles gift of giving from the heart. I have never seen so many people pay so much for white elephant auction items in the spirit of giving to charity," said real estate agent Steve Webber. Real Living Lifestyles agents believe that their work is not just about houses, it's about people. At the end of the day what matters most is improving the lifestyles of San Diego residents, and community service is just of the ways this brokerage does that!